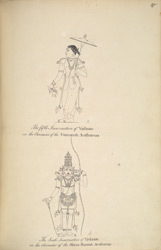 Pen and ink drawings of Vamana and Rama, from an 'Album of 51 drawings (57 folios) of buildings, sculpture and paintings in the temple and choultry of Tirumala Nayyak at Madura. c.1801-05', by an anonymous artist working in the South India/Madurai style, c. 1801-1805. Each picture is inscribed with a title and a number in ink. This drawing is of a carving that can be found in the Minakshi Sundareshvara Temple of Madurai, the sacred complex built under the patronage of the Nayaka ruler Tirumala in the 17th century. Within the large enclosure are two temples dedicated to Shiva as Sundareshvara with his consort Minakshi, and several mandapas (halls) with elaborately sculpted columns of the gods from the Hindu pantheon. Vamana is the fifth incarnation of Vishnu and is the god in the form of a dwarf. The god assumed this shape to recover the universe from the demon Bali. The dwarf appeared before Bali and begged him to allow him to rule as much land as he could cover in three steps. He then transformed himself into the giant Trivikrama and covered the whole world in three strides, making Vishnu the master of the universe and pushing Bali into the underworld regions. The second drawing is of the seventh incarnation of Vishnu, Rama the god-king. He is the hero of the Ramayana epic in which he kills the demon Ravana, who had abducted his wife Sita and was creating havoc to the cosmic order.